Alternate universes. Virtual reality. Virtual worlds. Role playing (not the dirty kind, although maybe that too.) These have been figurative and — increasingly — literal playgrounds for geeks and nerds throughout the ages. I grew up playing Dungeons & Dragons in my parents’ basement, thought Tron was the coolest movie evah, went crazy over Myst despite the fact that I couldn’t play worth a damn, and devoured books that introduced sci fi nerds everywhere to (at the time) forward-looking concepts like the Web and the Metaverse; books like Neuromancer and Snow Crash. Today, of course, I do a fair bit of thinking about what the advent and evolution of 3D online virtual environments mean for media, marketing and business in general. Yet, in the age of short attention spans it is easy to forget that the concept of virtual worlds has a long, rich history that goes back a hundred years or more. And that some of us have always been virtual residents of one kind or another. NYC multimedia artist and metaverse consultant to the stars Annie Ok has created a very cool timeline that aims to document the history of all things virtual and may even help us remember that humankind’s fascination with second lives is more far-reaching that the recent trend that brought us Second Life. Not limited to the concept of virtual worlds as we currently define them, Annie’s timeline takes into consideration everything from literature, film and art to hardware, software and Interrnet-based platforms. Built with a sweet Web 2.0 service called Dipity, the timeline is interactive and editable by anyone — just like a wiki but much cooler to look at. Thanks for the props, Greg! 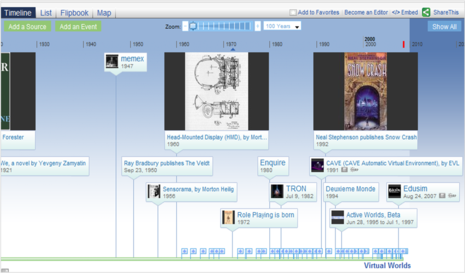 An interactive, collaborative timeline of the history and development of virtual worlds, created by Annie Ok on Dipity. Perpetual work in progress.